Network39 has paid special attention to create their PHP scripts with extensive settings options with the intention of giving clients the option to create custom, unique web-sites "out of the box". From within the settings section inside of the administration control panel, the web-site administrator can adjust and tweak just about every aspect of their new web-site. Scroll down the page to view further details for each available settings section. From within the general settings section, the web-site administrator can adjust the following meta setting options. 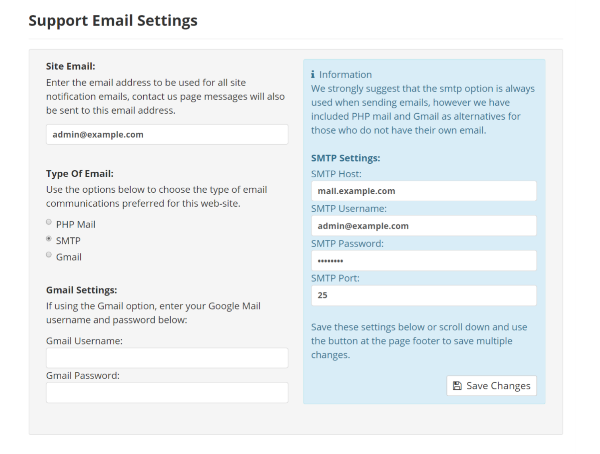 From within the general settings section, the web-site administrator can adjust the following support email setting options. Type of mail to use for web-site support: SMTP, PHP Mail or Gmail. If Gmail, enter Gmail user login details. If SMTP, enter SMTP server login details. From within the general settings section, the web-site administrator can adjust the following quick links menu setting options. Enable or disable the quick links menu inside the backend. If the quick links menu is enabled, choose the default state of menu: open or closed..
From within the general settings section, the web-site administrator can adjust the following RTL (right to left) language support setting options. Enable or disable RTL support. If enabled this will render all text to a right to left format. RTL is required for certain languages that adopt RTL format. From within the general settings section, the web-site administrator can adjust the following redirect timer setting options. Various areas around the web-site script will use a redirect to send the site visitor to another page, use the redirect timer setting to set the amount of time in seconds for the redirect timer to fire. Enable or disable page redirect timer. Set the amount of time (in seconds) before a page re-direct is fired. From within the general settings section, the web-site administrator can adjust the following pretty url's setting options. Decide on the type of page extension used. From within the general settings section, the web-site administrator can adjust the following web-site logo setting options. Enable or disable your web-site logo. From within the general settings section, the web-site administrator can adjust the following analytics code setting options. Use this settings option to embed any analytic code into the footer of your web-site, without the need to touch any code. This input field can also be used to embed any extra java or html required to be added to the web-site footer. Embed analytic or java code into web-site footer. From within the maintenance settings section, the web-site administrator can adjust the following PHP error reporting setting options. PHP error reporting. 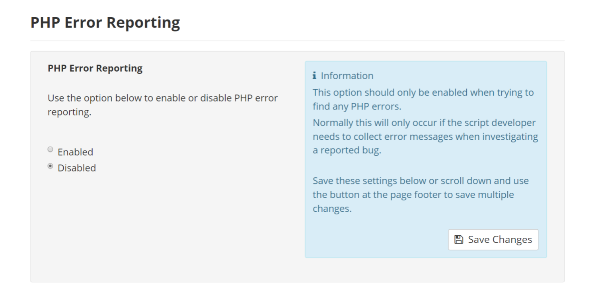 Use this option to turn on or off the ability to receive PHP errors, this option is used to find possible bugs. 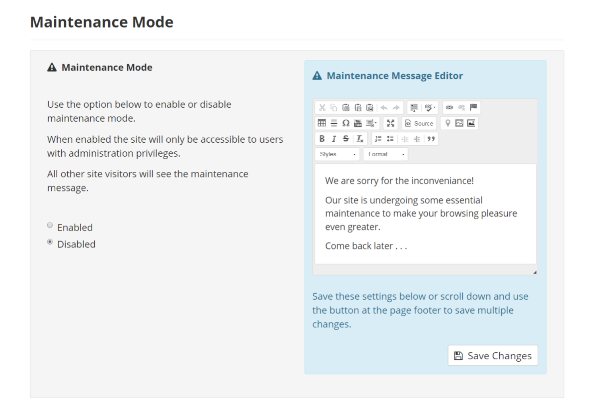 From within the maintenance settings section, the web-site administrator can adjust the following maintenance mode setting options. Turn on or off web-site maintenance mode. When enabled the site will only be accessible to users with administration privileges. All other site visitors will see the maintenance message. From within the modules settings section, the web-site administrator can adjust the following modules setting options. Enable or disable web-site modules. Any add-on or premium modules will be added to this section. 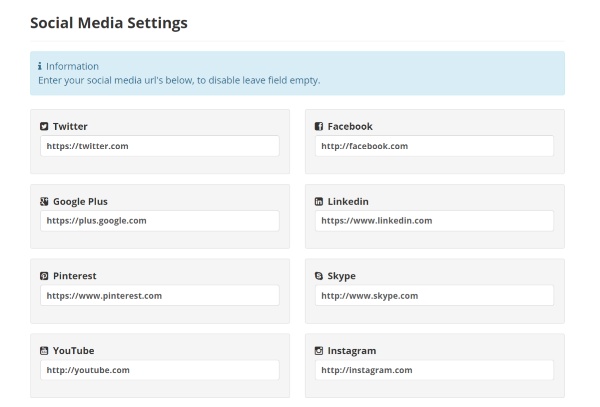 From within the social media settings section, the web-site administrator can adjust the following social media setting options. Enable or disable visual social media links in the web-site footer. Easily add visual links to your social media properties. From within the anti-spam settings section, the web-site administrator can adjust the following anti-bot security questions setting options. From within the anti-spam settings section, the web-site administrator can adjust the following IP blocker setting options. Enable or disable any IP address's in the banned IP list from visiting your web-site. For more information regarding this function click here. From within the monetization settings section, the web-site administrator can adjust the following Amazon setting options. Enable or disable the ability to embed Amazon affiliate links into web-site content. Enter your Amazon affiliate link. 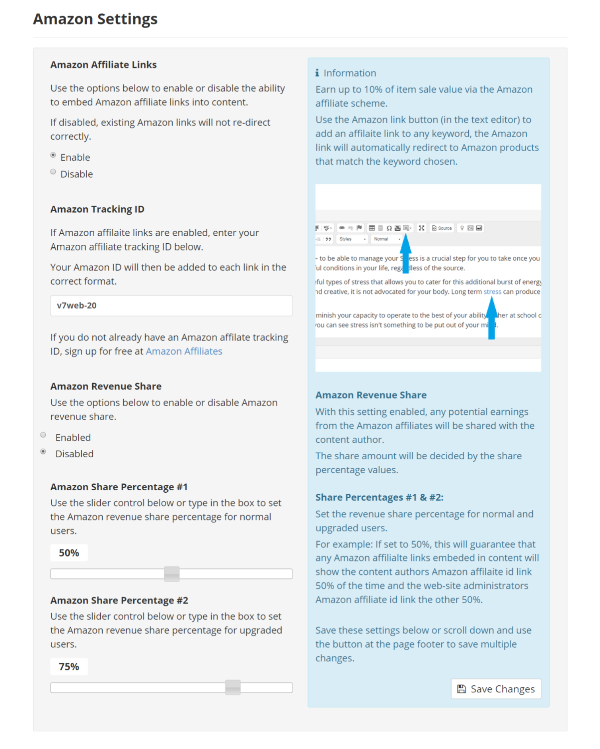 Enable or disable Amazon revenue share with your web-site content contributors. If Amazon revenue share is enabled, decide on the revenue share percentage for normal content authors and upgraded content authors. From within the monetization settings section, the web-site administrator can adjust the following Adsense setting options. Enable or disable the ability to embed Adsense adverts into web-site content. Enter your Adsense publisher ID. Choose the type of Adsense advert displayed. Image, text or Image & text adverts. Enable or disable Adsense revenue share. If Adsense revenue share is enabled, decide on the revenue share percentage for normal content authors and upgraded content authors. Change the Adsense advert colours to suit your web-site design. From within the monetization settings section, the web-site administrator can adjust the following Infolinks setting options. 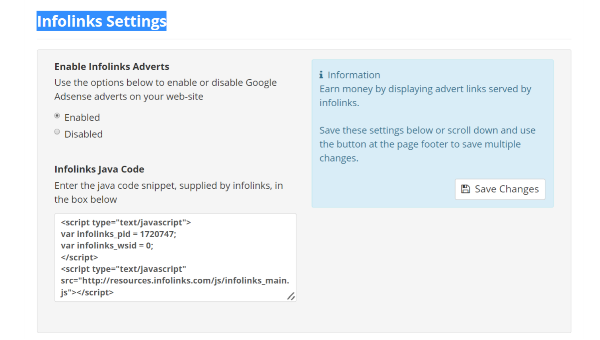 Enable or disable the ability to embed Infolinks adverts into web-site content. Enter your Infolinks java code. From within the pages settings section, the web-site administrator can adjust the following pages navigation widget setting options. Set the max number of page links to show in the pages navigation widget. The pages navigation widget can be added, removed or re-positioned to various web-site pages via the widget layout forms, just drag and drop the widgets to their required page areas. 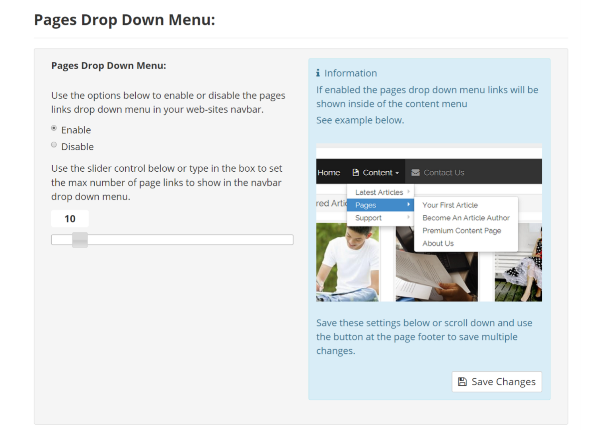 From within the pages settings section, the web-site administrator can adjust the following pages drop down menu setting options. Enable or disable the pages links drop down menu in your web-sites navbar. Set the max number of page links to show in the navbar drop down menu. 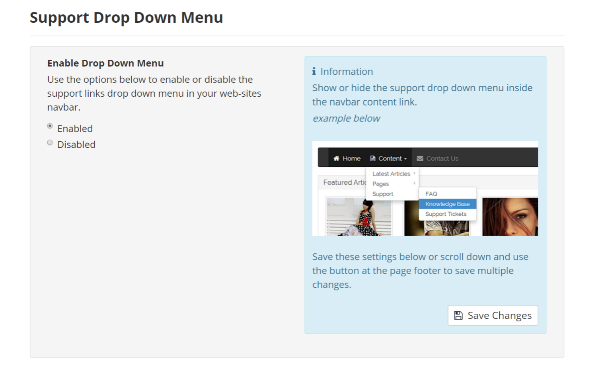 From within the support settings section, the web-site administrator can adjust the following support drop down menu setting options. Enable or disable the support links drop down menu in your web-sites navbar. From within the support settings section, the web-site administrator can adjust the following support email notifications setting options. Enable or disable support email notifications. If enabled an email will be sent to the site email each time a new support ticket is submitted. From within the support settings section, the web-site administrator can adjust the following support categories widget setting options. Enable or disable the support information snippet count shown against each support category. Set the default position of the support categories widget box. If the above is set to closed the support categories will be hidden, within the widget, until clicked. 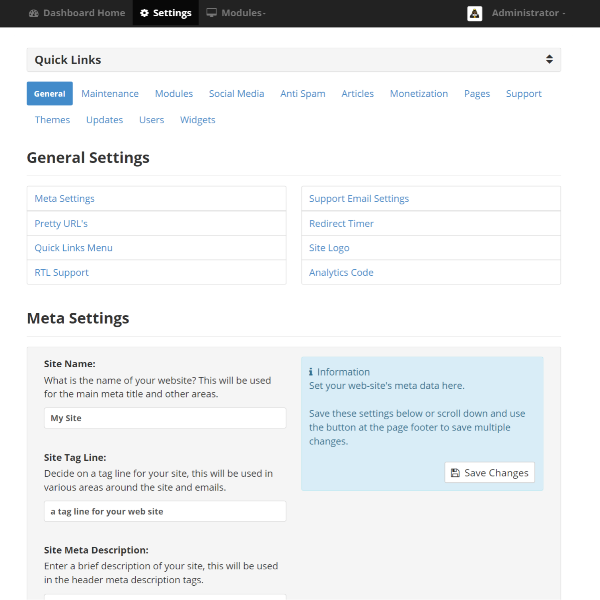 From within the theme settings section, the web-site administrator can adjust the following theme max site width setting options. Set the maximum width, in pixels, for this web-site. 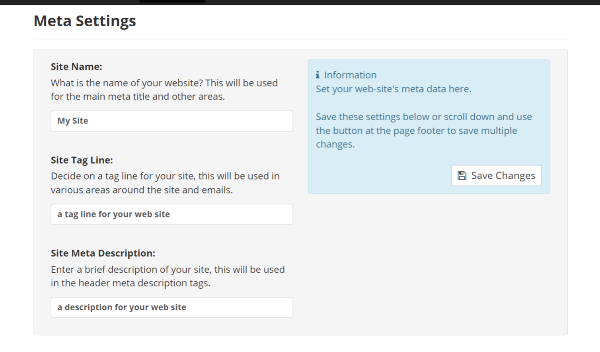 From within the theme settings section, the web-site administrator can adjust the following theme content box setting options. 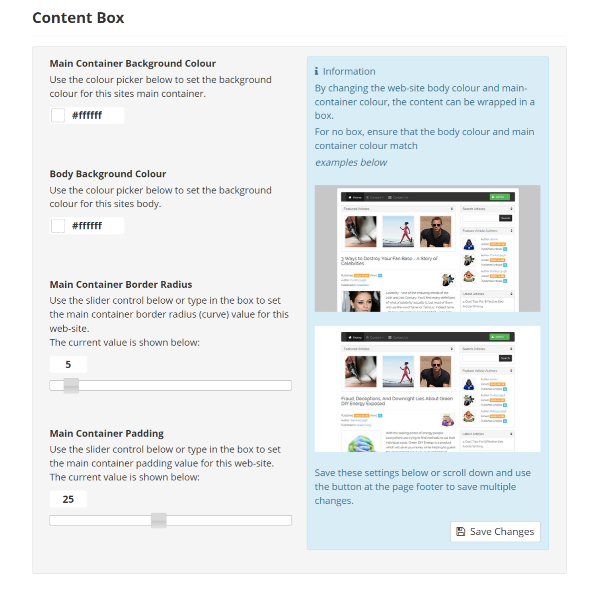 use the theme content box settings to create a content box for your web-site content. Set the background colour for this sites main container. Set the background colour for this sites body. Set the main container border radius (curve) value for your web-site. Set the main container padding value for your web-site. From within the theme settings section, the web-site administrator can adjust the following theme panel heading setting options. use the theme panel heading settings to decide the panel heading colour for your web-site content. 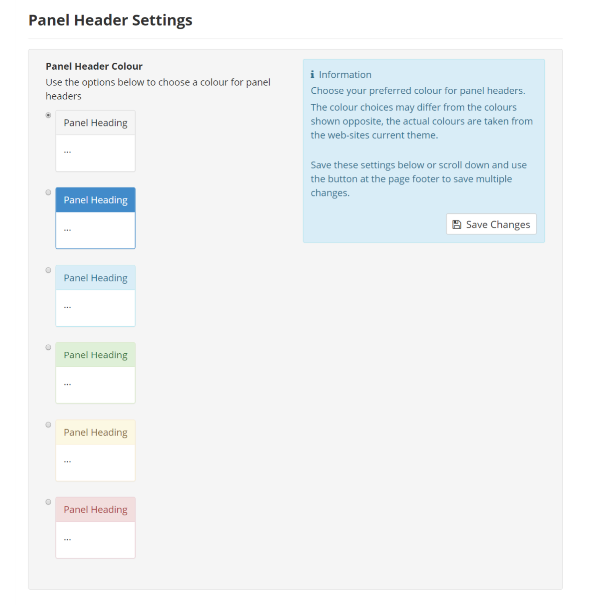 Choose a colour for panel headers. 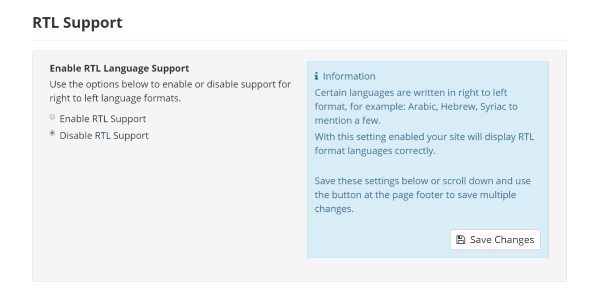 From within the theme settings section, the web-site administrator can adjust the following theme typography setting options. 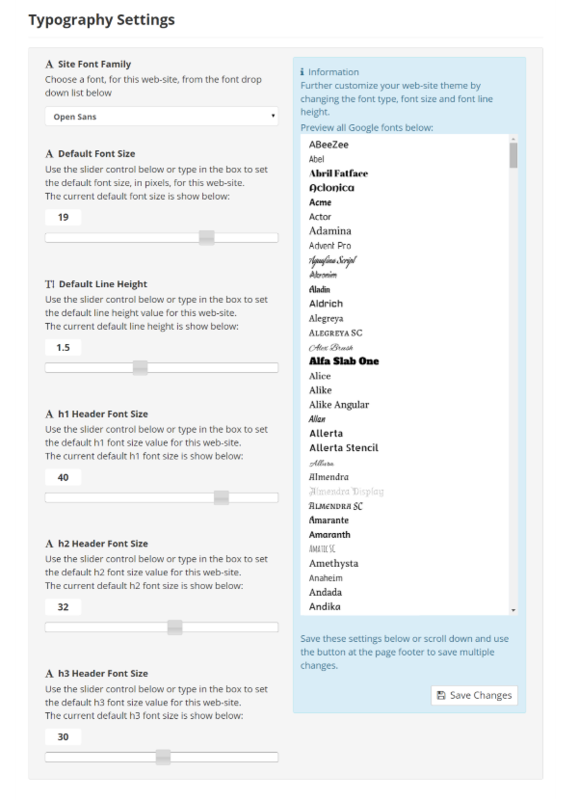 use the typography settings to decide various font settings for your web-site content. Choose a font, for your web-site, from the font drop down list. Set the default font size, in pixels, for your web-site. Set the default line height value for your web-site. Set the default h1 font size value for your web-site. Set the default h2 font size value for your web-site. Set the default h3 font size value for your web-site. 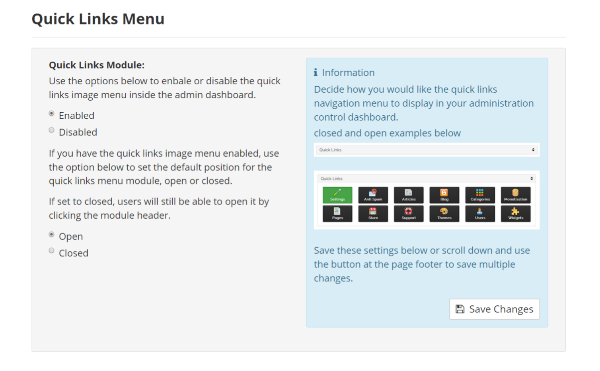 From within the theme settings section, the web-site administrator can adjust the following theme menu setting options. Decide if your top navigation menu should be fixed, to the top of screen, or not. Modify the navigation menu look by inversing the navigation menu css colours. From within the user settings section, the web-site administrator can adjust the following user new user registration setting options. Enable or disable new registrations on this web-site. From within the user settings section, the web-site administrator can adjust the following user upgrade setting options. Set the type of upgrade offered to your users, either a one off payment or a monthly subscription. Set the price for a user upgrade. Enter the email address that will take your PayPal payments. Set the currency accepted for product payments and displayed on product pages. From within the widget settings section, the web-site administrator can adjust the following disqus comment widget setting options.